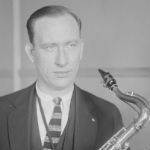 Isham Jones (January 31, 1894 – October 19, 1956) was an American bandleader, saxophonist, bassist and songwriter. In 1911 one of Jones’s earliest compositions was “On the Alamo.” The Isham Jones band made a series of popular records for Brunswick throughout the 1920s. He led one of the most popular dance bands in the 1920s and 1930s. His first successful recording, “Wabash Blues”, was recorded in 1921. This million-seller stayed for twelve weeks in the U.S. charts, six at No. 1. In 1932, he added Joe Martin, another of the band’s violinists, as a frequent vocalist. In April that year, young Bing Crosby recorded two sessions with Jones’s group which included “Sweet Georgia Brown”. Crosby at this point in his career was still singing in a jazz idiom, transitioning to his better known “crooner” style. In August 1932, Jones signed with Victor, and these records are considered among the best arranged and performed commercial dance band records of the Depression era. Jones’s recordings during this period rivaled Paul Whiteman, Waring’s Pennsylvanians, Leo Reisman and other dance orchestras as examples of the most popular dance music of the era.